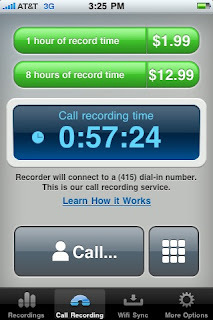 This is probably old news by now, but yes, Recorder now allows users to record outgoing calls made through Recorder! Because the iPhone's SDK doesn't provide a way to directly record calls, the feature works by connecting the call to an external service which connects and records the call. Since there are costs associated with maintaining this system, there is a small fee to record calls which ends up being a few cents per second. Sessions of call recording can be purchased in increments of one or eight hours, and you can record as many conversations as you want until the minutes are up! Even though the call is connected through our service, the call recipient still sees your number in their phone. Right now the service is only available in the US, but we're working to get it set up in other countries as well. Please get this working in Australia?? Please get this working in turkey? ?